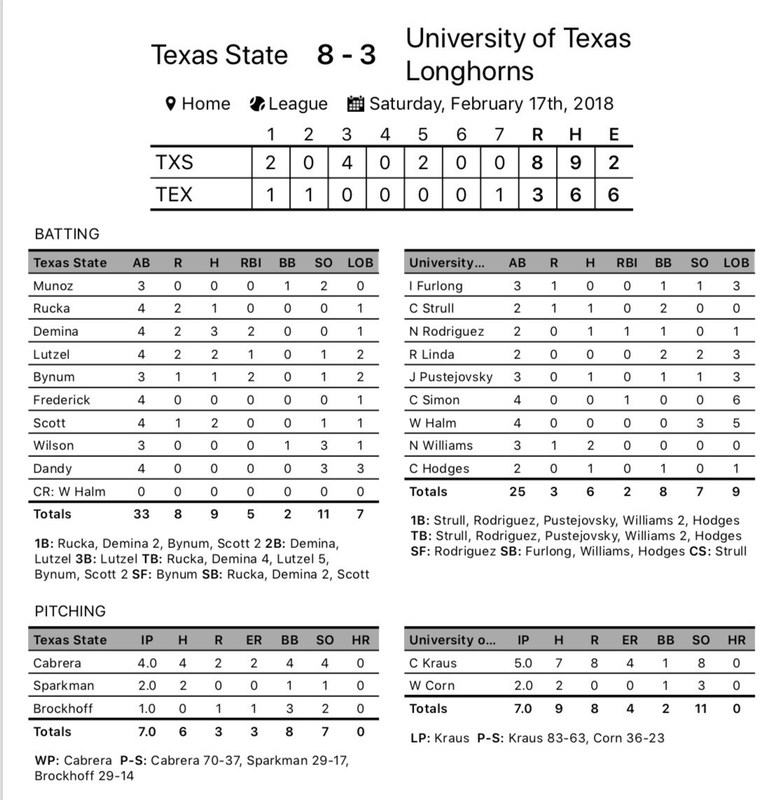 University of Texas Longhorns fell behind early and couldn’t come back in an 18-14 loss to Texas State on Sunday. Texas State took the lead on a walk in the second inning. 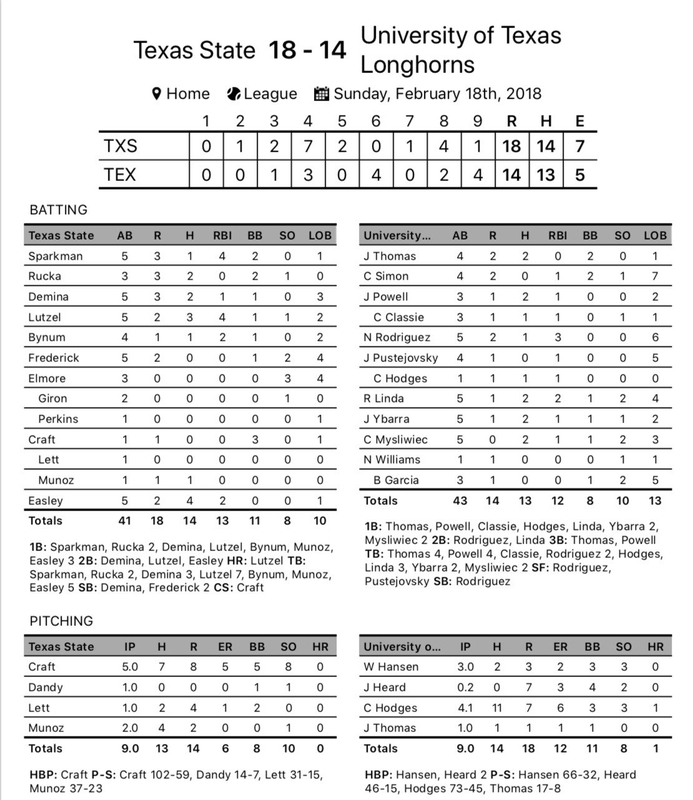 Despite the loss, University of Texas Longhorns did collect 13 hits in the high-scoring affair. Unfortunately, Texas State had 14 hits on the way to victory. In the second inning, Texas State got their offense started when Craft drew a walk, scoring one run. University of Texas Longhorns put up four runs in the ninth inning. 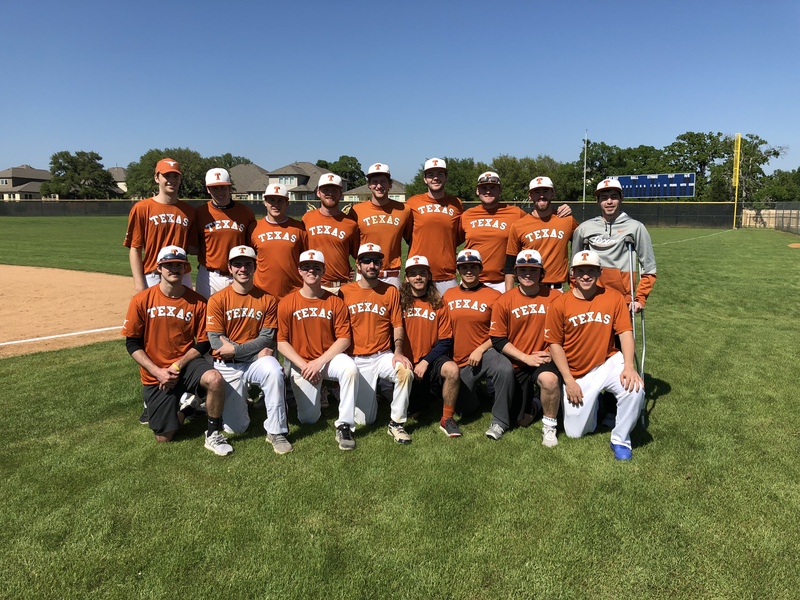 University of Texas Longhorns put the pressure on, lead by singles by Clay Hodges and Remington Linda and a double by Nick Rodriguez. Texas State scored seven runs in the fourth inning. The big inning for Texas State came thanks to an error on a ball put in play by Sparkman and Bynum, a single by Easley, and by Rucka. Craft led things off on the rubber for Texas State. He surrendered eight runs on seven hits over five innings, striking out eight. Will Hansen was on the mound for University of Texas Longhorns. He lasted three innings, allowing two hits and three runs while striking out three. Hodges, John Thomas, and Josh Heard each contributed in relief for University of Texas Longhorns. 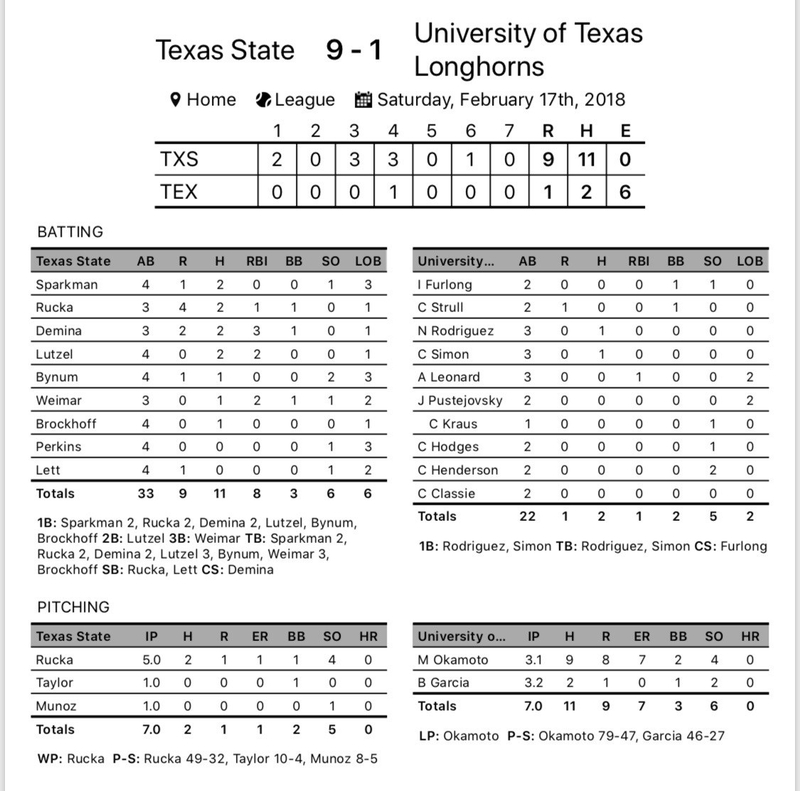 University of Texas Longhorns racked up 13 hits on the day. Jordan Powell, Cody Mysliwiec, Linda, Josh Ybarra, and Thomas each managed multiple hits for University of Texas Longhorns. Thomas, Ybarra, Linda, Mysliwiec, and Powell each collected two hits to lead University of Texas Longhorns. Texas State racked up 14 hits. Easley, Lutzel, Rucka, and Demina each collected multiple hits for Texas State. Easley went 4-for-5 at the plate to lead Texas State in hits.